Ophelia is a 19-year-old who developed Complex Regional Pain Syndrome at only nine years old, is from Ontario Canada and uses the pronouns they/them/their. They were originally told by a doctor that they were only experiencing growing pains. They reflected on the experience saying “I always knew it was not growing pains because growing pains do not put you in a wheelchair”. Ophelia’s pain started in both knees and has now spread to their entire body. In 2013 they went into remission after a stay at the Children’s Hospital of Philadelphia in their chronic pain program; but the pain returned a year later and it came back full force. Currently Ophelia spends a lot of time conserving their energy at home, but they are able to become more mobile with their wheelchair, without which they would be stuck in bed. We openly spoke about what life is like with CRPS when you are not able to fully function, when you need assistive devices and when the pain becomes incredibly discouraging. 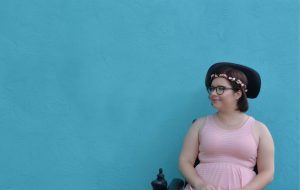 How was the transition to using a wheelchair? Q. Have you found support through online CRPS groups? What was your experience at the Children’s Hospital of Philadelphia? What are your tips and tricks to getting through a bad pain day? We further discussed what it is like as someone with low mobility to read and see others with CRPS doing fully functioning activities. Through our discussion we came to the conclusion that it is a difficult topic because we all fluctuate within our own ableism. Sometimes jealousy can sneak into play because everyone wants to be able to do as much as possible. For a long time, Ophelia only needed to use a cane to be mobile, as they said: “I have been in other people’s shoes before but have become worse to where a cane is no longer an option”. There is no pain exactly alike, but we are stronger when we support each other because there will always someone who understands what is happening. With online media making it possible to participate in any fashion, Ophelia has gained a significant following on their Instagram and specifically Twitter account. I did ask which platform they most prefer and they laughed and said “I use Twitter the most because when you are stuck in bed you don’t have that many photos; there’s only so many photos of my wall that I can post”. Ophelia’s motive towards social media is about educating people on CRPS. They know that this is not something you learn about in school or from your parents and therefore people like them are a great source to learn about these topics. It is a place of community, “I have friends and followers who are also disabled, have CRPS and/or chronic pain and we can all just feel it together”. “I have friends and followers who are also disabled, have CRPS and/or chronic pain and we can all just feel it together”. Through dealing with CRPS, Ophelia has become an activist and advocate. They have shared with me that always having something to look forward to is important. They are currently looking forward to a trip to Disney World, but small things like ice cream or a movie night work perfectly. I am sure that Ophelia will continue to educate and connect with other warriors like them.